Check out our “Ultimate Fly Fishing Vehicle.” Hook a drift boat up to this fully restored 1966 Bronco and you too can travel to the river in style and with a 302 engine you can get there in a hurry! All you have to do is book a trip with Empty Creel Fly Fishing Guides and Outfitter. 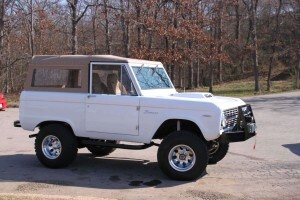 Bo’s son, Trent, has done a beautiful job restoring this U 13 Bronco. Ford only manufactured five thousand of these Broncos so it is really a special vehicle. I sure wish Bo would let me drive it!